Week 14 of the university football season is when championships are won and places for the playoffs are decided. 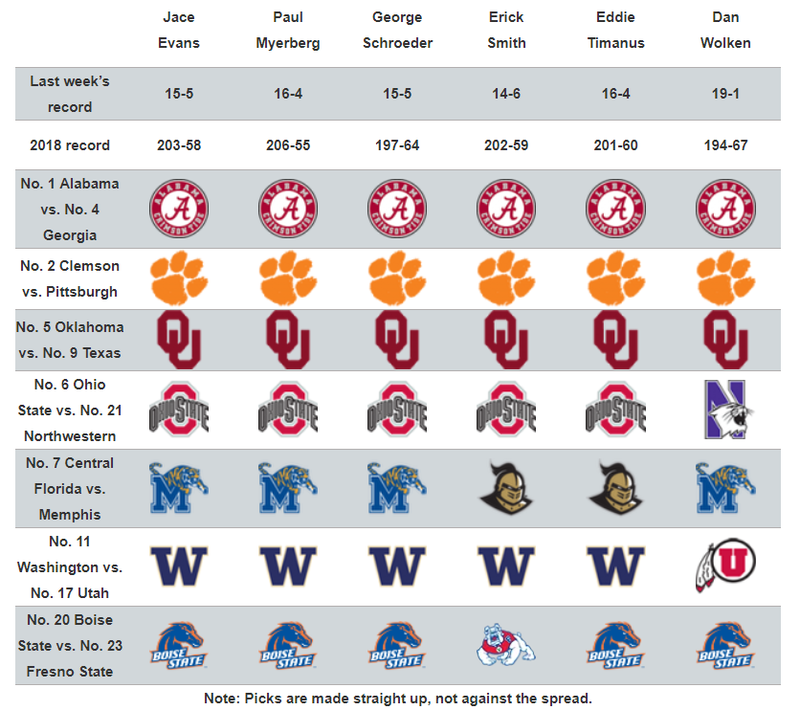 USA TODAY staff selects the games. SportsPulse: Dan Wolken and Paul Myerberg split the College Football Playoff ranking before the weekend of the conference championships and if the committee was successful, placing Oklahoma over Ohio State. Week 14 of the university football season is when championships are won and places for the playoffs are decided. The biggest game on the calendar includes the numbers 1 Alabama and 4 Georgia. It's a rematch in the same place as the spectacular College Football Playoff championship game of last year. This time, the SEC title is in play and the guarantee of a place in the pack this season. The Tide could still be in the top four with a loss, but they do not want to leave things to chance. If Alabama is serving, the focus is on two other league games. Oklahoma has risen to fifth place in the poll and playoff rankings. A win over Texas No. 9 would allow the Sooners to avenge their only loss of the season and give them an excellent argument for being included in the pack with their fourth straight title in the Big 12 championship. The only challenge in their place would come from Ohio State. The Buckeyes, ranked sixth, face the 21st North West in the Big Ten title match. They will visit the field on Saturday night knowing what happened with Georgia and Oklahoma. They will know if an impressive win against the Wildcats, who have won seven consecutive games in the Big Ten category, could be enough to get the committee to choose them. Beyond games with implications for the playoffs, there are other intriguing intrigues. No. 11 Washington and No. 17 Utah will battle for the Pac-12 title and a place in the Rose Bowl. The Utes have never played in Pasadena. The Huskies are no longer since the 2000 season. The US No. 20 Boise State and No. 23 Fresno meet for the Mountain West title, and the winner could well qualify for the New Year if Central Florida lost against Memphis in the American Athletic Championship game.